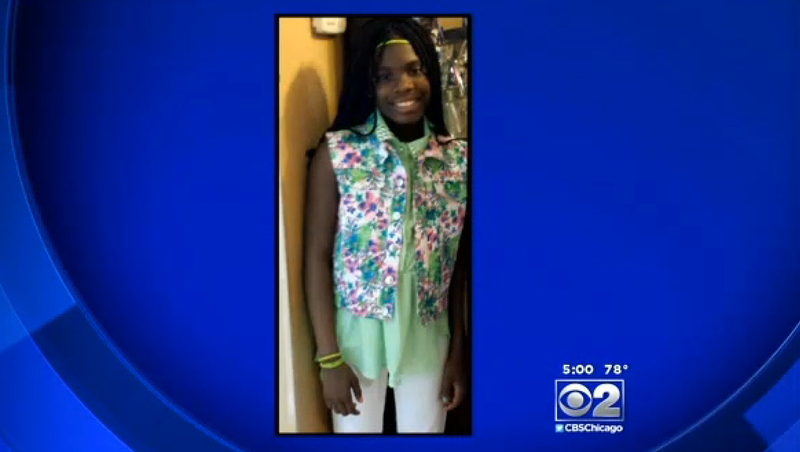 CHICAGO - The mother of an 11-year-old girl who was killed by a stray bullet fired into her friend's home during a slumber party didn't allow the girl or her twin brother to play outside because she was so afraid of Chicago's street violence, the girl's great-grandmother said Sunday. Lourene Miller said that if her great-granddaughter, Shamiya Adams, was going to hang out with friends, she had to remain indoors. "My granddaughter (the girl's mother, Shaneetha Goodloe) would cry every time she'd see a child killed on the news (and) Shamiya was never just out." A police spokeswoman, Janel Sedevic, said Sunday afternoon that nobody has been arrested in Friday's shooting. He declined to say if there were any suspects. Investigators believe the person who fired the fatal shot was apparently aiming at a rival in a gang dispute, but missed. The bullet went through an open window of the house, pierced a wall and struck Shamiya in the back of the head. Shamiya was one of four people killed by guns in Chicago since Friday night, according to the Chicago Sun-Times. Thirty-two others were wounded. Miller said her family did all it could to protect the little girl, yet must now make plans to bury her. "It is just terrible out here," she said. "These young guys out here are shooting and a lot of times they miss their target and they always hit somebody innocent." Miller said her great-granddaughter had recently had a friend over for a sleepover and on Friday night it was the other girl's turn to host a sleepover. "My granddaughter dropped her off, kissed her on the head and told her she loved her," she said. "A great-grandmother should not have to bury their great grandchild," Miller told CBS Chicago. "This is some pain I can't even explain, it hurts so bad." Now the girl joins a grim roster of innocent victims in a city plagued by gun violence. Since 2012, when Chicago was the only city in the nation to record more than 500 homicides, there have been numerous stories of victims like Shamiya who were doing nothing more dangerous than talking with friends. The most high profile of those shootings happened in 2013, when a 15-year-old honor student named Hadiya Pendleton was shot to death as she sat in a park about a mile from President Barack Obama's house. Just last May on the city's South Side, a 58-year-old teacher died when a bullet, allegedly fired by one man at a rival driving by, punctured the wall of an office where she was sitting and struck her in the chest. The number of shootings has dropped in the city since then, but the spasms of gunfire continue, including one over the July 4 weekend in which 14 people were killed and dozens more were injured.